In a worldwide conference that will be noted for several historic announcements, the Church of Jesus Christ of Latter-day Saints announced on Saturday the appointment of Gerrit Gong and Ulisses Soares to its Council of the Twelve Apostles. Their calls represent a significant diversification in the church’s governing bodies. Gong, an American-born political scientist specialising in China, is the first Mormon apostle of Asian descent. Soares, a businessman from Brazil, is both the first from Latin America and the first from the Southern Hemisphere. The growth of church membership and increasing leadership from outside the United States were noted several times during the conference. Yet, as Jason Bruner recently noted on this blog, Mormonism has been largely ignored in the study of world Christianity. I offer a few factors contributing to this exclusion and then reflect on some benefits including Mormonism has for the field. First is the theological question whether Mormonism can be included within Christianity in the first place. Members of the Church of Jesus Christ of Latter-day Saints are accustomed to this question, though they often find it perplexing. Many will readily cite the name of their church to defend their Christianity, emphasising the name of Christ. Yet, from the standpoint of the creeds that have defined Western orthodoxy, Mormons are at the very least unorthodox. Individuals and churches can define Christianity for themselves, but so far as the study of world Christianity is concerned, Andrew Walls offers a suggestion. He notes that in surveying ‘representative Christianity’ through history ‘what appears of utmost importance to one group may appear intolerable, even blasphemous, to another.’ And so, Walls offers four criteria, or what he calls ‘a small body of convictions and responses which express themselves when Christians of any culture express their faith.’ These are (1) the worship of the God of Israel, (2) the ultimate significance of Jesus of Nazareth, (3) that God is active where believers are, and (4) that believers constitute a people of God transcending time and space.1 By this rubric, Mormons may be included within a big-tent definition of world Christianity. Other reasons for Mormonism’s exclusion from world Christianity studies are its American origins and the persistent attitude that Mormonism is an American religion. Originating in Jacksonian America, early Mormonism bore all the marks of homegrown religion, even incorporating native American peoples into its distinctive salvation narrative. Unsurprisingly, scholars of Mormonism are overwhelmingly historians trained in American history. That is changing, but the number of non-Americanists is comparatively small. Where histories do venture away from American shores, they tend to be institutional and faith-promoting. They often lack indigenous voices, favouring missionaries’ triumphal narratives of conversion. The methods and paradigms Bruner notes that define world Christianity are mostly absent. As the relatively-new field of Mormon studies develops, one major advance in recent years is the establishment of Mormon studies chairs in several American universities, moving the study of Mormonism outside the institutional church(es).2 To date, those chairs have all been occupied by Americanist historians but Claremont Graduate University, which was the first to establish a Mormon studies chair, is now raising funds to endow a Center for Global Mormon Studies. In addition, a Global Mormon Studies Network has been founded with support from Claremont, the University of Virginia, the University of Auckland, Mormon-owned Brigham Young University, and the John A. Widstoe Foundation. The Widstoe Foundation, notably, is also seeking to endow a chair in Mormon studies at the University of Southern California, specifically to focus on non-historical, social-scientific research of Mormonism. The Church of Jesus Christ of Latter-day Saints remains highly centralised. Policy manuals as well as hymnals, Sunday school curricula, and other materials are produced at church headquarters and distributed worldwide. Yet, the recent announcement that German-born apostle Dieter Uchtdorf will oversee the production of these materials and the appointments of Gong and Soares could signal a new openness to non-American paradigms. Tracking these changes could be a fruitful exercise. Mormonism provides a case study of the formation of a new religion, which could shed light on the study of Christianity in general. This is aided by a Mormon scriptural mandate to keep records, many of which are open to scholars. Mormons field one of the largest missionary forces in the world and give missiologists many possibilities for study. And while I have focused here on the largest body of Mormons, the Church of Jesus Christ of Latter-day Saints, there are others and scholars interested in schism have no shortage of smaller Mormon groups to study. 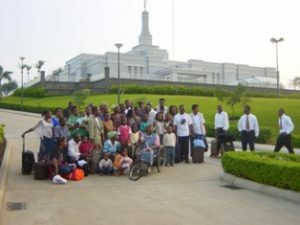 Independent Mormon groups in West Africa are a particularly interesting example of this phenomenon. Excluding Mormonism from world Christianity robs the field of some of its most interesting potential data sets. This entry was tagged Africa, China, Missions, Mormonism, United States, World Christianity by Jeffrey Cannon. Bookmark the permalink.